Hans Zimmer performances are always very special in my book. I have seen him perform in Belgium, Poland and I attended his live tour in Hamburg, Germany in 2016. One thing those concerts had in common was that they were all extremely loud. For his last show in Hamburg I was prepared, since I brought earplugs with me, making that performance quite enjoyable. 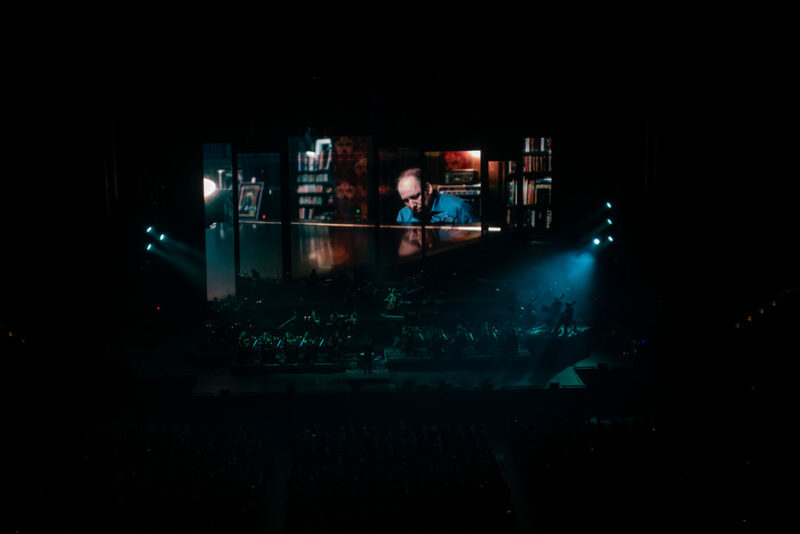 Last year a new Hans Zimmer tour was announced: The World of Hans Zimmer – A Symphonic Celebration. Once again I traveled to Hamburg to attend a concert of this tour in the same venue where I had heard Zimmer’s previous performance two years ago. One glance at the stage was enough to make me aware that this concert would be special. 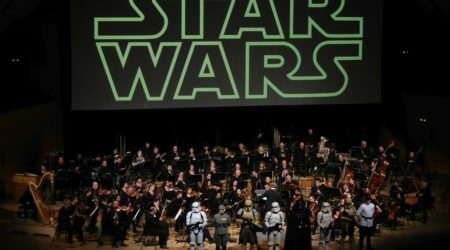 The stage was divided into small platforms for each section of the orchestra and in the middle a place for Zimmer’s own musicians, playing the piano, guitar, bass guitar, exotic flutes, a cello and a violin. Also, in the back you could see several vertical screens, each of them hanging at a different height, making it a playful view for the audience. After Gavin Greenaway started to conduct the first piece, the lighting and the visuals started to react to the music from The Dark Knight was played by the orchestra and soloists. During this performance the small stages lit up, giving a visual boost to the performance. For the next piece, the flute player Pedro Eustache came to the front of the stage and started playing. I recognized King Arthur immediately. During this piece, two of the vertical screens started to shift: revealing a 16-member choir, stacked in three rows, singing the chants. After this magnificent piece, which is one of my favorite soundtracks of his, Hans Zimmer himself appeared on the screen. He was talking, but we could not hear what he was saying since the sound was still muted. At the end we could, finally, hear him speak German, welcoming his friend Greenway, who picked up the microphone to say how delighted he was to be present this evening. Zimmer introduced the next piece on the screen, which was MI:2. The guitarist Amir John Haddad – El Hamir started playing “Seville,” where musicians in the audience started to clap the Spanish rhythm before they supported the guitarist with their own instruments. This piece transitioned perfectly into “Injection” which is one of my favorite Zimmer pieces of all time. I had not heard it for a long while. 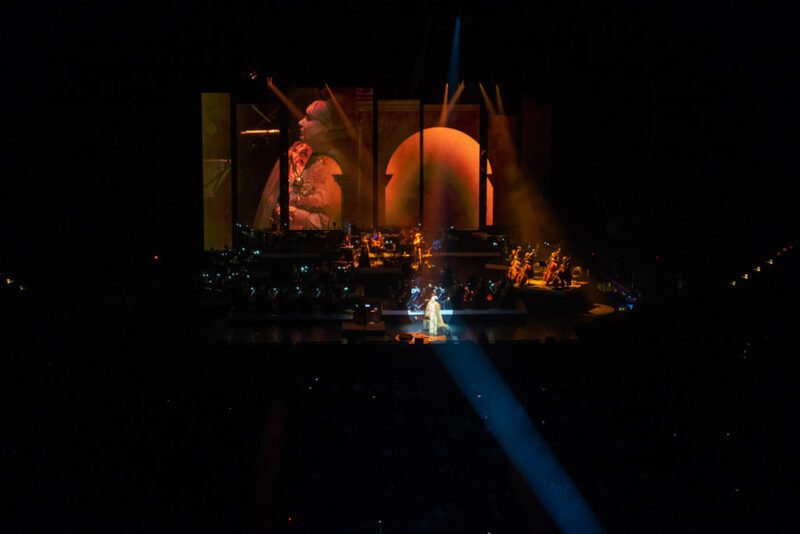 Then it also hit when Lisa Gerrard entered the stage it was the first time that i realized she was performing in this particular piece, and her cooperation was announced for this concert. The performance was absolutely stunning. Her voice was wonderful in combination with the guitar, the bass guitar and the choir. After the beautiful and emotional piece from Pearl Harbor with a solo for cello, played by Marie Spaemann, director Ron Howard joined Zimmer in the screen, telling the audience all about the movie Rush. The music starting with a cello solo and transitioning into the orchestra taking over the melody. The next Ron Howard movie on the program was The Da Vinci Code. 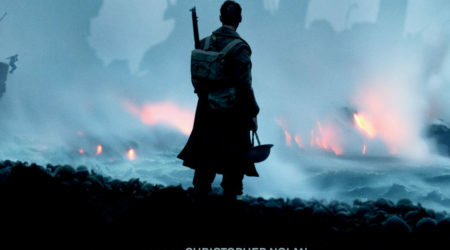 The suite was Zimmer’s so-called “sketchbook” of the movie which was mainly focused on the choir pieces from that score and ending with “Chevaliers De Sangreal” That piece is starting to become a classic. I was not that fond of this version though: there was a drum pattern in each musical sentence that is not in the original, the different feeling preventing goosebumps to appear on my skin. It felt misplaced. The first piece after the intermission was the joyful music from Madagascar with the animated animals from that movie dancing on the screens. When they appeared I could hear exclamations of happiness throughout the audience. It took me a while to recognize the next piece. I was very happy when I discovered that it was from the animated movie Spirit – Stallion of The Cimarron that I have not seen in a long time, but with a soundtrack that I have owned for a long time and listen to regularly. It was quite a treat to finally experience it live. I even did not mind the heavy drumming in some parts of that piece. Pedro Eustache- who played at the tour – was the same guy that did the recording of Kung Fu Panda. He played the small theme from this movie full of emotion. I was a little sad when it was over all too soon. After a beautiful and sort of rocky performance of The Holiday, with a small introduction by Zimmer and the director Nancy Meyers, we could enjoy a stunning cello piece written for Hannibal. It was elegantly and emotionally played by the soloist and became even more gorgeous when the choir and the orchestra joined in. I had never heard this piece from Zimmer and I was quite surprised of the fact that Zimmer, who is known for all these action movies and the occasional animation or romantic movie, could write such a classical and emotional piece. It was quite a transition when Lebo M. appeared on the screen and started to sing his trademark part from “Circle of Life.” The suite from Lion King that came after the introduction, was a pleasure to listen to. 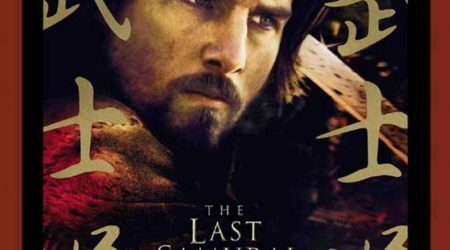 It contained a lot of instrumental pieces from the movie instead of the more popular songs, which for me, was a pleasant change to what I had heard from that movie in the past. Since Lisa Gerrard was present, it came as no surprise that Gladiator was the final piece of the program. I saw this movie with a live orchestra in the Polish city of Krakow, where Gerrard was also announced to perform. Sadly, she was not able to make it to that concert, making it quite a treat for me to finally see her sing her own music from that movie. Her performance of “The Wheat” and “Now We Are Free” was absolutely stunning to hear, but also “The Battle” was magnificent to witness with all the visuals, the music and the real fires that were lit on the stage. After Zimmer thanked the audience, he started the first encore “Time” from Inception on the piano in his studio, which the orchestra picked up on and continued. We could, of course, not leave the venue without hearing Pirates of the Caribbean, where all his own musicians came to the front of the stage for one last time. Personally, I really enjoyed this concert. When it was announced, I was hoping for a good focus on the symphonic part, and the creators of the show and the musicians delivered. There is not really much to criticize the performance. I really loved how the stage was set up, with the different levels for the musicians to sit on, the visuals, and how the choir was displayed. Hans Zimmer addressed the audience like he was present at the concert, while it was, of course, just a recording. I also liked how Gavin Greenaway interacted with the audience. What I thought was the best thing about this concert was the program: I had not expected certain pieces to be played. King Arthur and Spirit – Stallion of The Cimarron contain such beautiful music which probably not many people know that well. But my biggest surprise was MI:2 with Lisa Gerrard performing. That moment I will treasure for a long time. The only thing I am a bit sad about is, that while in the initial announcement music from the games Modern Warfare 2 and Crysis 2 was announced – I was looking forward to that – they were not played. I was also hoping for my favorite Zimmer score: The Rock, which would have fitted perfectly in the program. Of course, you cannot have it all, it is always good to hope for more in the future. 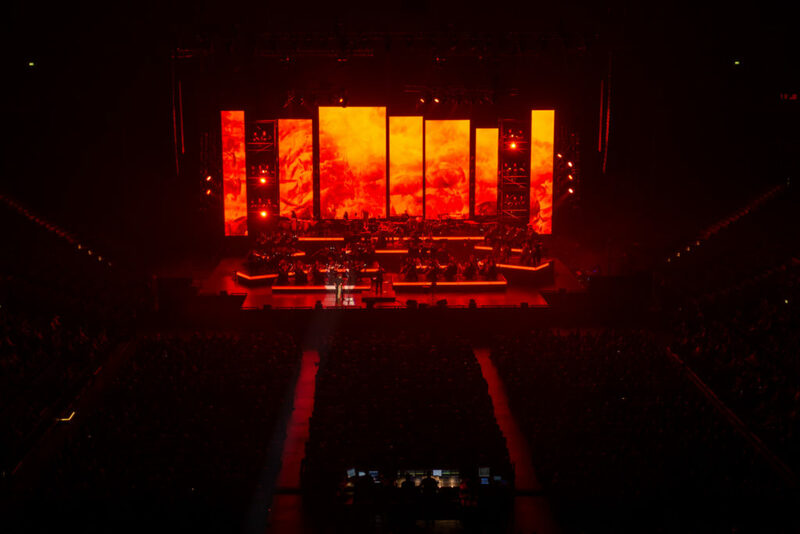 The show will be touring for a while and will come to Rotterdam in November, so I still have time to decide if I want to experience it again – I probably will. The first half was an hour, and the second half 90 minutes. I recall the concert starting 15 minutes late. So I would make it at least three hours. Enjoy! It was a great show.